This game, designed in Illustrator and Photoshop and exported into Unity, is based off of a short animation clip depicting the Evil Queen from Snow White. We were assigned to develop a game revolving around a story. My game essentially reimagined the plot from Snow White, where the Evil Queen is the main character who was scorned, and Snow White and the Seven Dwarves were the villains who scorned her. I began by creating a still image in Adobe Illustrator that represented my main character, the setting, and the story. This image was then transformed into a short animation clip using Adobe Animate CC, that depicted the Evil Queen seeking justice for former wrongdoings against her. After I had determined the plot, setting, and characters, I used Adobe Photoshop in order to create pixelated sprites and sprite sheets that would fit the aesthetic of my game. I decided to go with a more nostalgic, Super Mario-esk look. 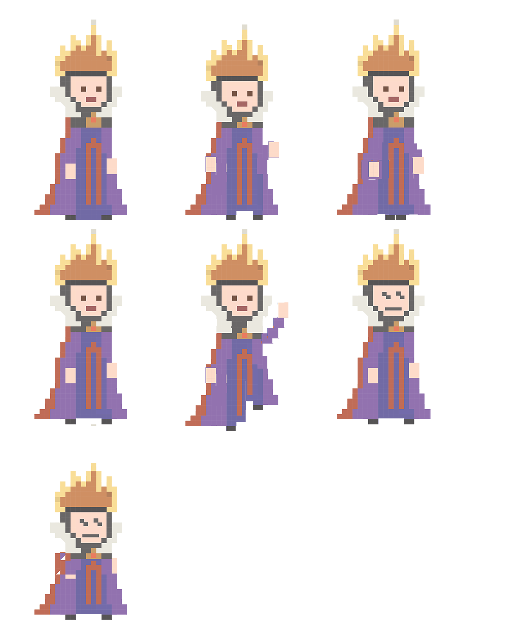 Each sprite sheet showed what the characters in motion would look like depending on their game state. And the still images, such as the bricks, stones, plants, and potions to collect, were always static. I used similar game controls to a version of a Super Mario game and wrote scripts and used animators within Unity to create functions and determine each character and object's behavior within the game. By using the left, right, and up arrow keys, the player is able to make the Evil Queen run left and right and jump up and down in order to kill her enemies (the Seven Dwarves) and collect potions to increase her score.